This is research on the Burma/China relationship and why one should boycott the Beijing Olympics. 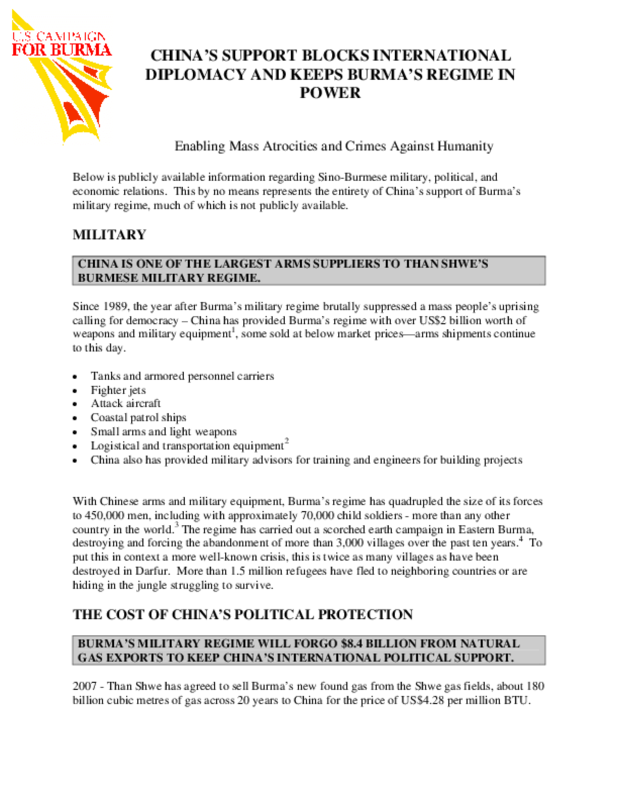 China is the largest overall supporter of the dictatorship in Burma. Currently, China is one of the largest arms suppliers to the military regime, supplying them with over 2 billion US Dollars worth of weapons and military equipment including tanks, fighter jets and military advisors for training. This has allowed Burma's regime to quadruple its size to 450,000 men, including approximately 70,000 child soldiers. China is one of the largest economic supporters of Burma as well. China has more than 2 billion US Dollars worth of investments in Burma, and the government gives Burma hundreds of millions of dollars in grants and loans. Burma relies on China's support. The regime is currently giving up money for natural gas by selling it to China for less than its value to keep China's international political support. China has also voted against UN Sanctions to help the people of Burma. Copyright 2008 United States Campaign for Burma. All rights reserved.